Birthday Cake 5in1 Combo Popups jump house climb slide basketball Buy It today! Happy birthday Cake 5 in 1 Combo! 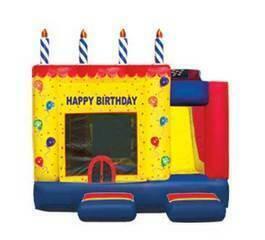 Huge 170 square feet of birthday bouncing, basketball shooting, pop op obstacles, rock wall hill and thrilling slide. 18'(L) x 15'(W) x 17'(H) footprint combo needs a 21’ x 20’ area for set up. This complete unit rents for full day. Buy or Rent it today Give us a call if you are interested in owning this exciting birthday cake!